My husband and I used to fall into occasional restaurant ruts, frequenting the same three or four restaurants over and over again. Even in New York, where any city block might offer dozens of choices, we would still find ourselves alternating among just a few neighborhood favorites. As a food writer, I have the opposite problem. 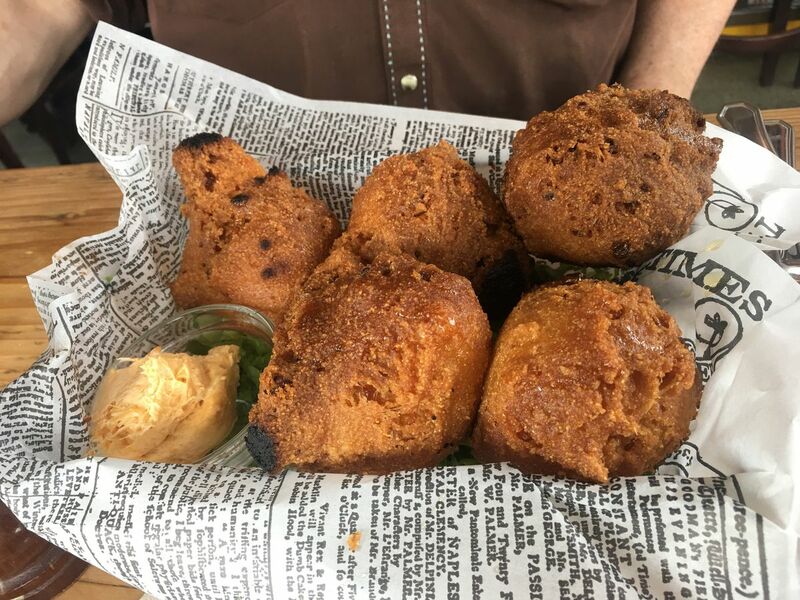 I rarely have the luxury of returning to restaurants that I love because I'm always on the lookout for the newly opened eatery, the unexplored neighborhood, or the recently discovered strip-mall gem. I eat. I write. I move on. Not that I'm complaining. I'm well aware that I have the most enviable job in the world. However, this constant quest for the new (or, at least, new-to-me) sometimes means that my opinions about well-established restaurants are out-of-date. I'm often asked about my favorite spots and I have to offer up my suggestions with the caveat that I haven't visited some of them in years. Rustic Goat is a prime example of this. I reviewed it favorably when it opened and I've been recommending it ever since. And when I recently learned they were updating their menu, I did a quick check to see how long ago that was. Five years. I've been recommending a restaurant that I haven't been to in five years. Either I was going to have to stop recommending it, or I was going to have to eat some comfort food. Guess which one I chose. I met my husband for a mid-week lunch and was happy to see that the space hasn't lost its newly built gleam. 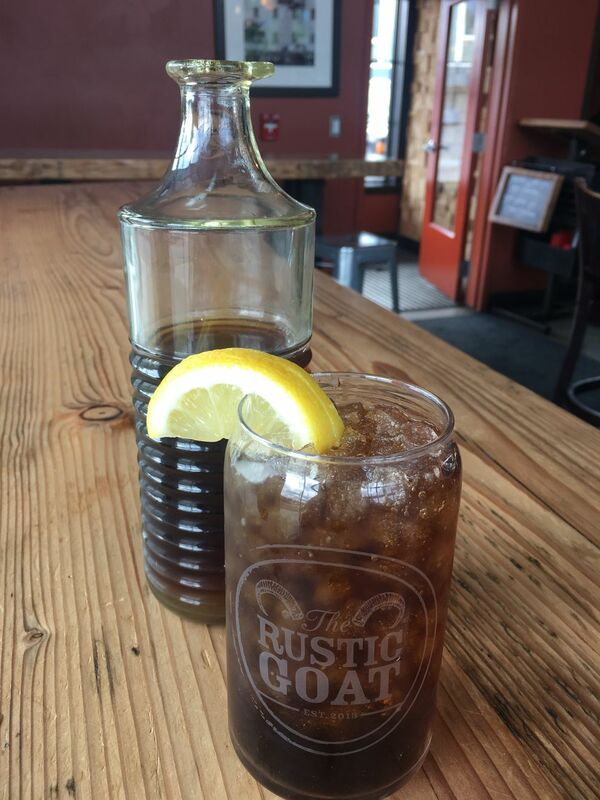 To me, Rustic Goat is one of the most attractive and well-maintained restaurants in town. I love its light and airy feel, with floor-to-roof windows, open two-story design, and its mix of industrial chic and Alaska rusticity. It has an inviting bar downstairs, sit-down seating upstairs, as well as a deck for al fresco dining in the summer. I prefer the hustle of the downstairs bar, with its proximity to the open kitchen and for its superior people-watching opportunities. My husband ordered a beer and I opted for iced tea, which I only mention because it was unexpectedly delicious. Which, I know, sounds ridiculous. I was assured that the pre-sweetened tea was nothing like the tooth-achingly sweet Southern style sweet tea that I studiously avoid. It was perfect, with strong tea flavor and just enough sugar to cut any bitterness. I also appreciated that it was served with a back-up tumbler that gave me two or three refills. I have never before devoted an entire paragraph to a glass of iced tea, but this drink reminded me of the restaurant's Kaladi Brothers DNA and its commitment to good caffeinated drinks. Our shared grilled Romaine salad ($7) came to the table on two plates – a bit of service that I really appreciate. Romaine is the perfect vehicle to pick up the smokiness from the grill and the flavor is well balanced by the sweetness of the shallot bacon jam and the brightness of the buttermilk blue cheese dressing. The bison sliders ($18) weren't available as sliders due to a temporary pretzel roll shortage (which will henceforth be known as The Great Pretzel Roll Shortage of 2018). But our server offered it to us as a full-sized burger on brioche and asked the kitchen to halve it for us. This was a solid burger, though I would have liked a lighter hand with the cheese (words I never thought I would type). Cambozola is one of my favorite cheeses but it's aggressive, and it slightly overwhelmed, rather than balanced, the lovely vanilla fig jam and the subtle flavor of the bison. The balance on this dish might be better when served slider-style as intended. I returned the following week for dinner with my daughters and it was therefore a given that we would start with the macaroni and cheese ($11). This is a decadent, faithful version of the comfort food standard-bearer. The cheddar was ample and pleasingly sharp against the sweetness of caramelized onions and the salty punch of bacon. 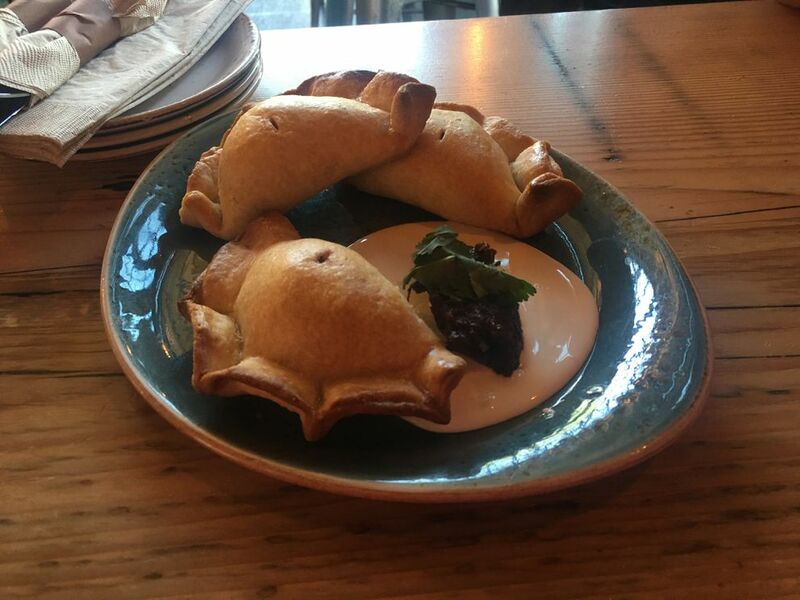 We also shared an order of the pork empanadas ($12) and they were an instant favorite. A thick, flakey pocket of pastry was the perfect vehicle for the rich, tender, garlicky pork within. This trio of meat pies was served atop a "table cream." I had to look this up — it is a slightly less fatty heavy cream. It tastes like … a slightly less fatty heavy cream. A heap of pleasingly smoky red chili paste is served on the side if you're looking for more heat. My younger daughter ordered the chicken Rockefeller pizza ($16), asking our server to "hold the rabbit," as in no onions, spinach or tomato. Admittedly, this pizza bore no resemblance to the chef's original concept, but the result was undeniably tasty. Mozzarella, cream cheese, garlic cream, chicken, bacon and herbs were destined to be good friends. We were less excited about the chicken marsala ($20). A comfort food classic, the description on the menu was mouthwatering: fresh fettuccini, mushrooms, Marsala cream sauce and golden raisins. But somehow the dish added up to less than the sum of its parts. It was a bit bland and the pasta was ever-so-slightly past al dente. Happily, the Rustic Goat hot pot ($20) was packed with flavor and was, for me, the star of the menu. Buckwheat soba noodles, smoky, seasoned beef, house made kimchi and a six-minute egg all swim in a rich savory broth of bacon and mushrooms. Tangy, creamy, meaty and earthy with an underlying herb-y freshness, this was a bowl full of everything I love to eat. Rustic Goat continues to serve up reliable and sometimes inspired comfort food in a uniquely beautiful space. And while I'll always be on the search for the next shiny new food truck or sushi spot or date night destination, I won't let it go another five years before visiting again. Hours: 6 a.m.-10 p.m. Mon.-Thurs., 6 a.m.-11 p.m. Fri., 7 a.m.-11 p.m. Sat. and 7 a.m.-10 p.m. Sun. Dinner served from 5 p.m.